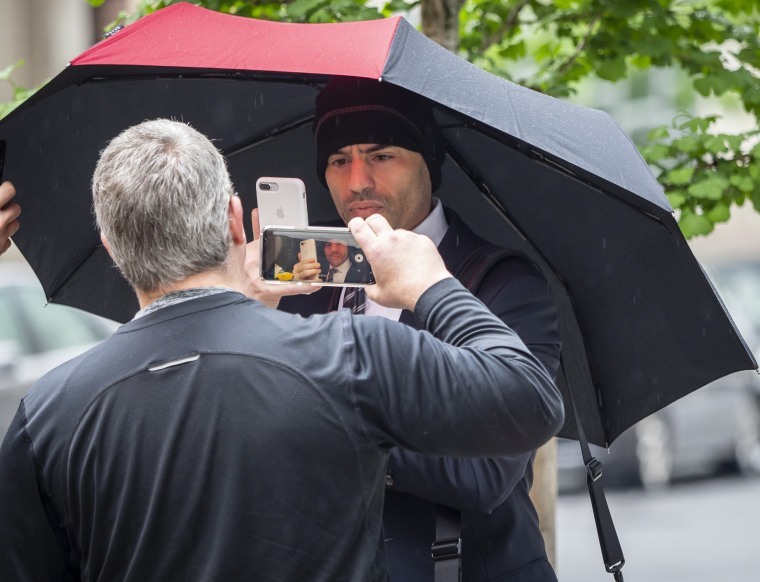 Aaron Schlossberg was caught on camera berating restaurant employees for speaking Spanish and threatening to call immigration authorities. Two New York lawmakers filed a formal complaint Thursday against a Manhattan lawyer who was caught on camera ripping into a restaurant worker and customer for speaking Spanish and threatening to sic immigration authorities on them. The move came a day after video of the attorney, identified as Aaron Schlossberg, went viral — and on the same day his face landed on the front page of the New York Daily News with a headline written in Spanish that the tabloid translated as "Screw you, idiot." "What we witnessed in the vile video from Mr. Schlossberg, which has since gone viral, is a humiliating and insulting attack on the more than 50 years of progress that this nation has made since the civil rights movement," Bronx Borough President Rubén Díaz Jr. and Rep. Adriano Espaillat, D.-N.Y., wrote in a letter to a New York attorney grievance committee. "We watched Aaron's video and we were disgusted." Schlossberg, who is 42, was laying low on Thursday, not returning telephone calls, and the contact function on his company website, which states that he does business in Spanish and other languages, appeared to be disabled. Emerging from his Manhattan apartment earlier Thursday to find a scrum of reporters on his doorstep, Schlossberg hid beneath an umbrella and refused to answer questions. Meanwhile, Yelp was cleaning out the avalanche of negative reviews and 1-star ratings of Schlossberg's firm that were posted after he became infamous, CNBC reported. An "active cleanup alert" was on his page. "This business recently made waves in the news, which often means that people come to this page to post their views on the news," it said. "While we don't take a stand one way or the other when it comes to these news events, we do work to remove both positive and negative posts that appear to be motivated more by the news coverage itself than the reviewer’s personal consumer experience with the business." Schlossberg was an obscure business and commercial law attorney before Tuesday, when he wandered into the Fresh Kitchen restaurant on Madison Avenue and began berating the manager after overhearing a conversation in Spanish between a customer and an employee — an encounter that witness Deena Suazo videotaped and that her husband, Edward, later posted on his Facebook page. Edward Suazo didn't identify him but called him, derisively, a "big man." When his words were greeted with laughter and jeering, Schlossberg appeared to grow even more incensed. "My guess is they're not documented so my next call is to ICE to have them kicked out of my country," he told the manager, referring to U.S. Immigration and Customs Enforcement. "I pay for their welfare. I pay for their ability to be here. The least they can do is speak English." Schlossberg wrapped up the rant by mocking a woman eating a sandwich. "Maybe you shouldn't eat that sandwich," he could be heard saying. "Maybe you should take a break from the food." What happened next is a classic example of news — and outrage — spreading rapidly through social media, along with some expert crowd sourcing. Shaun King, a former Daily News columnist currently writing for the Intercept, got wind of the video and posted it on Twitter at 8:15 a.m. Wednesday, asking his 969,000 followers for help in identifying the "bigot" in the white shirt. Based on his Twitter thread, it appears that it did not take long before he came up with an ID. Schlossberg is not a member of the New York State Bar Association, a spokesman said. Nor is there any report of public discipline against him on file with the association, records show. He contributed $500 to the campaign of President Donald Trump in May 2016, according to the Center for Responsive Politics. "On the other hand, Schlossberg may claim his conduct is protected by the First Amendment, which if true would prevent discipline," Gillers said in an email to NBC News. "Whether the conduct constituted disorderly conduct or is protected by the First Amendment are decisions that will turn on close analysis of the tape and the testimony of those who felt themselves threatened." That said, Schlossberg is not likely to be disbarred. "I think the most serious discipline he could face would be a private admonition if he has a clean record," he wrote. Schlossberg will, however, need to find a new business address. He used the Corporate Suites business center at 275 Madison Ave. in Manhattan to meet with clients and collect mail, but the landlord give him the heave-ho after seeing the video. "His actions are contrary to what we believe in as a community and goes against our rules and regulations," Hayim Grant, president of Corporate Suites, told NBC News. Schlossberg's old work digs are near the Fresh Kitchen and around the corner from the Mexican Consulate. Erin Calabrese, Ali Gostanian and Adam Reiss contributed.